In this tutorial, we will show you how to add HSTS to your domain. To know more about HSTS, visit our documentation link – What is HSTS? First select your Application from List of Applications or else select server and go to application dashboard. After that select your domain and click on More > Add HSTS on which you want to enable HSTS. 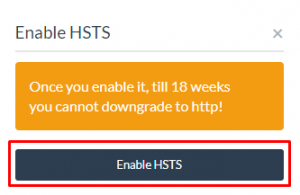 Note: If you add HSTS to your domain, you will not be able to disable it for 18 weeks. Thereafter, click on “Enable HSTS” in the modal box for confirmation.